As a small business owner, you know there are plenty of conversations you don’t want to have with a customer. From problematic service calls…to billing issues…to unexpected interruptions in your service (like winter weather or power outages)…there are all kinds of calls and emails you’d like to avoid, even when the “bad news” isn’t your fault. But let’s talk about the kind of conversation that sours a customer relationship before it even gets started — and how you can take control of your business info online to make sure it never happens again. 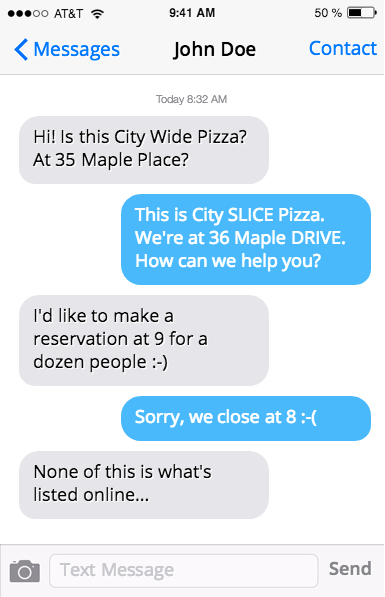 Looks like City Slice Pizza is about to lose 12 customers…!!! And remember: in the real world, your customers probably won’t try this hard. They’ll call the wrong number once…or drive to the wrong location once…and you won’t have the back-and-forth chance to set the record straight like you see above. The only thing you’re likely to hear from these customers…is nothing at all. Making sure your NAP info (your business name, address and phone number) is up to date on directory sites, review sites and even apps like Apple Maps is a must today. After all, if your customers can’t find you, they’ll find someone else. 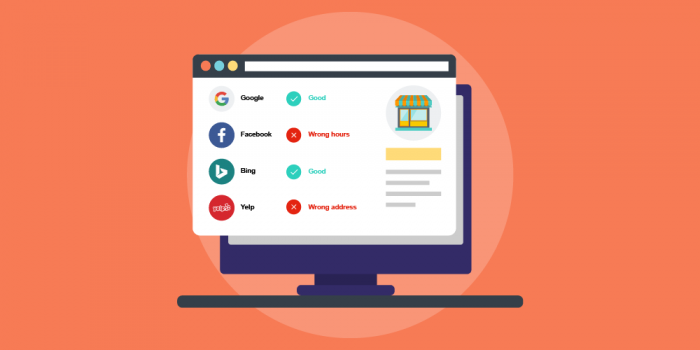 There’s no guaranteed way to make sure your customers don’t find inaccurate info online sometimes (after all, the average online business listing changes once every 6 days…there are probably lots of autogenerated listings for your business that you’ve never seen…and your hours may change for holidays and vacations too) but there are ways to monitor your listings — and correct, protect and take control of them whenever and wherever they change. The easiest way is with the right partner — someone who can keep an eye on ALL your listings across the Web while you focus on running your business. If you’re ready to update your online business info, see how Hibu Listings Management can help you get the right business information in front of your local customers.